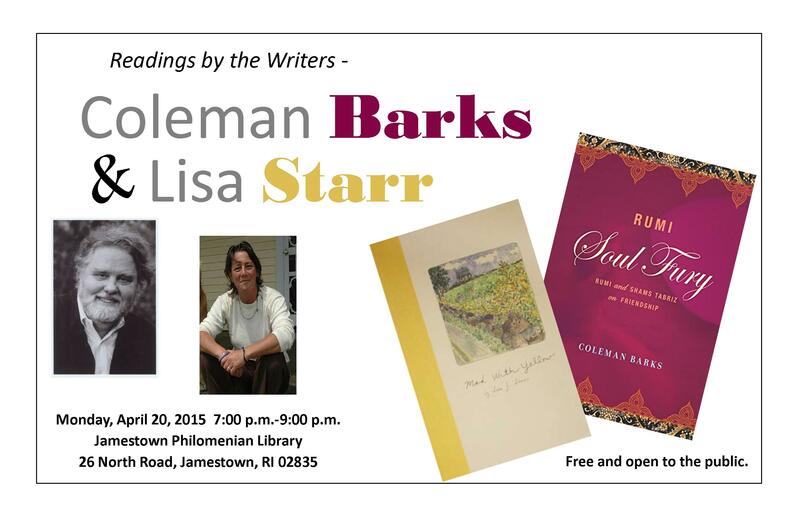 The Jamestown Philomenian Library invites you to attend a special evening of story telling and poetry with Guest Poets Coleman Barks and Ms. Lisa Starr. Coleman Barks, a poet and professor emeritus at the University of Georgia (UGA) in Athens, has gained world renown for his translations of Near Eastern poets, especially Jalal al-Din Rumi. He is also an accomplished poet, whose interest in Near Eastern mysticism infuses his observations of southern landscape and life. Barks has published several collections of his own poetry and numerous poetry translations, and his work has appeared in a wide array of anthologies, textbooks, and journals. His Rumi translations have sold over a million copies. Ms. Lisa Starr is the founder of the Block Island Poetry Project, a nationally acclaimed celebration of the arts and humanity and was the Poet Laureate of Rhode Island from 2008-2013. She is a two-time recipient of the Rhode Island fellowship for poetry, a former college instructor, waitress, freelance writer and publicist. During her time as RI Poet Laureate Ms. Starr established poetry circles in hospitals, homeless shelters, the state prison, and agencies for children with severe disabilities. She has published three full-length collections of poetry: Days of Dogs and Driftwood (1993), This Place Here (2001), and Mad with Yellow (2009).